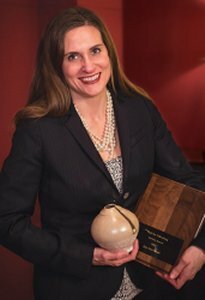 Moss & Barnett was pleased to honor Jana Aune Deach, a member of our family law team, as the 2014 recipient of the Paul Van Valkenburg Community Service Award. Moss & Barnett established the Paul Van Valkenburg Community Service Award* in 2001. It is awarded annually to a Moss & Barnett team member in recognition of his or her outstanding volunteer contributions to the community. The award is named after our now deceased colleague, Paul Van Valkenburg, whose volunteer career set an example of the spirit of service and dedication that we seek to promote and recognize throughout our firm. Jana has served the public in one form or another in a variety of ways and over many years. She serves on the Board of Directors of Mindekirken Foundation, raising capital through fundraising to support Mindekirken, the Norwegian Lutheran Memorial Church. The Church, founded by Norwegian immigrants in 1922, serves as the spiritual center for the Norwegian American Community and is the only church in America that still uses Norwegian as the primary liturgical language. Among other things, the Church sponsors the annual Liev Eriksson International Festival, celebrating Nordic cultural roots in the United States with concerts and classes in Norwegian language and culture. Jana also serves as President of the Congregation. Since 2012, Jana has served as the Chairperson for the Dignity and Empowerment Committee of the Oslo Center for Peace and Human Rights. Jana was instrumental in organizing the seminar Dignity & Empowerment: Women as the Keys to Global Food Security, which brought together an international panel to promote the United Nations’ goal of empowering women, through agriculture and economic programs, to be part of the solution to world hunger. Jana contributes her energy to a number of other charitable organizations, including Breaking Free, a Minnesota-based, nationally recognized non-profit agency that helps women escape prostitution and sexual exploitation through advocacy, housing, education, and other services. For the past two years, Jana has coordinated the holiday adopt-a-family program by the women attorneys of Moss & Barnett. In addition, she coordinates collecting donations to Breaking Free. Jana also helps several organizations, including Loaves & Fishes, Feed My Starving Children, and the Ronald McDonald House, to fulfill basic needs, such as food and housing. Jana contributes so much time and energy to fundraising and other volunteer activities at Trinity School in Eagan that, in reviewing a list of her contributions, the volunteer coordinator at the school thought it must include typographical errors. There were no errors on the list: Jana is a dynamo, whose capacity for giving seems boundless. Past recipients of the Paul Van Valkenburg Service Award include Chuck Parsons (retired), Kevin Busch, Cheryl Riggs, Bill Haug (retired), Jennifer Reussé, and Betsy Kiernat. We are proud to recognize Jana and our other award recipients for their willingness to be a part of organizations focused on improving the lives of others. *The Paul Van Valkenburg Service Award includes a cash donation by the firm to the recipient’s chosen charity, a special recognition ceremony, and a commemorative piece of pottery created by Minnesota artist, Steve Hemmingway. For 2014, the firm's donation was made to Feed My Starving Children.